Like a lot of gamers out there, I’m tired of your standard JRPG protagonists. They’re always the same, always sullen, good-looking lone wolves with tragic pasts. 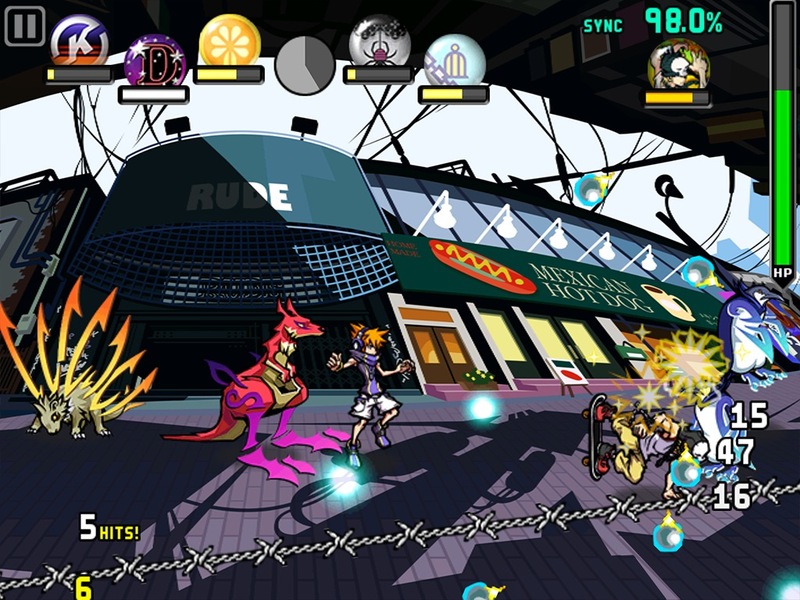 The headphones-wearing, purple-vested Neku Sakuraba of Square Enix’s The World Ends With You: Solo Remix ($17.99) is no different but that’s okay because it’s still a ridiculously brilliant game. Why am I so willing to forgive its faults? There are a lot of reasons. Some of them are connected to the fact the game’s an audiovisual feast for street culture enthuasists, others to the fact that the gameplay is, even now, a refreshing change from the norm. Most of all, however, it’s because the emo-ness actually makes sense here. 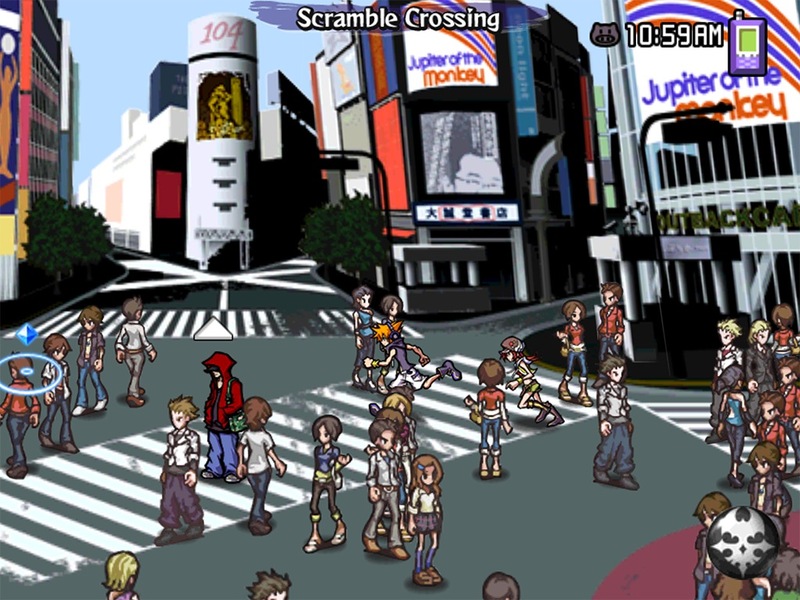 The World Ends With You: Solo Remix is a story about children transitioning from a safe environment into a darker, grimmer world. It’s a game set in freakin’ Shibuya, a place where high fashion and high pressure meet. If there’s anyone who deserves to be a little neurotic, it’s the kids in this game. The answer is yes. Yes, yes and yes again. Square Enix actually did an exemplary job at porting everyone’s favorite DS cult classic to the iOS platform. Sure, they could have made the price of entry a little lower and, maybe, asides from offering a Universal build, cleaned up the iPad version a little bit more (I can see the pixels, you bastards! ), but by and large, it’s stellar work. I’m especially impressed with how they’re revamped the combat system to better work with iOS surfaces, but we’ll get to that in a bit. When I said that The World Ends With You: Solo Remix is a treat for the senses, I meant it. There are certain caveats, of course. If you find graffiti and Japanese youth culture appalling or think there’s just too much damn anime in the world already, you probably won’t like the aesthetics found in this game. 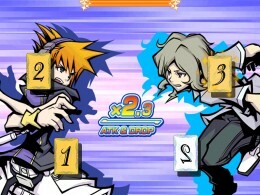 The World Ends With You: Solo Remix is a heady, hap hazardous mix of all those things. The enemies are half-beast, all tribal tattoos; the characters a stable of too-skinny kids with thick, comic-book lines and clothes befitting Shibuya royalty. And the music? It rocks. Specifically, it’s J-Rock and J-Hop and a whole bunch of other things wrapped up into one groovy medley of tunes. I won’t go too much into it but let’s just it’s one of the few soundtracks I own. As for the tale itself, it’s an interesting one. 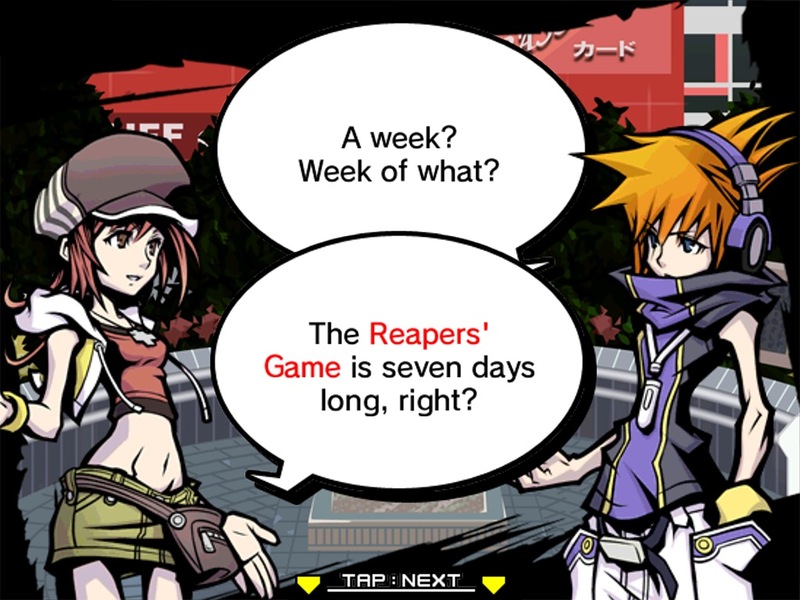 You play as the amnesiac Neku, a boy with a hatred for the masses and an unusual predicament. Unlike others, who come and go as they please, you’re trapped in Shibuya, a pawn in the Reaper’s Game. It’s a game you’re going to have to play. Failure to do so will result in erasure. 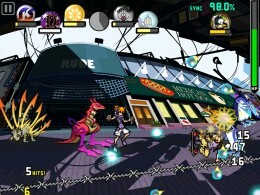 In regards to the gameplay itself, there’s a wide variety of things to do in The World Ends With You: Solo Remix. On the most basic level, you’re going to have to figure out how to fulfill the missions you receive each day. This can mean anything from battling the spirits haunting cursed statues to restoring power to a concert hall to collecting 1,000 Yen pins from the Noise. The Noise are the half-animal foes I was talking about earlier. Comprised of everything from frogs to kangaroos to sharks, the Noise are only visible to those involved in the Reaper’s Game. While some boss battles initiate on their own, a majority of your fights with the Noise happen when you tap one of the red Noise icons after you’ve scanned your surroundings (scanning also lets you do nifty things like look into the inner thoughts of random people and is accomplished by clicking on the little Player pin on the bottom right of your screen). Once you’ve done that, you’ll be transported to the fight. 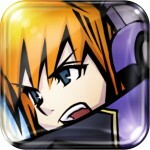 Like the original, the iOS version of The World Ends With You: Solo Remix makes creative usage of touch controls. Some abilities, or Psyches as they’re called, will ask you to tap feverishly on the screen while others may require you to draw lines of fire across the screen. It all varies, depending on the kind of Pin you have equipped. I haven’t been able to verify this for the iOS version just yet but in the DS version, you even had Psyches that required you to shout into the microphone. The fact this game is incompatible with microphone-less iPod touch devices could be telling. Unlike the original, however, there’s no dual-screen combat. Everything happens within the space occupied by your character. Here, in the Solo Remix version, your Partners function very much like another Pin except for one major difference. For best possible results, you’ll have to alternate your attacks with theirs to increase your sync percentage and to increase damage. Once your Sync rating has hit 100%, you’ll then be able to unleash an all-out, screen-wide attack. Yes, it’s definitely a significant change and one that can make the game feel a little too easy for veterans. 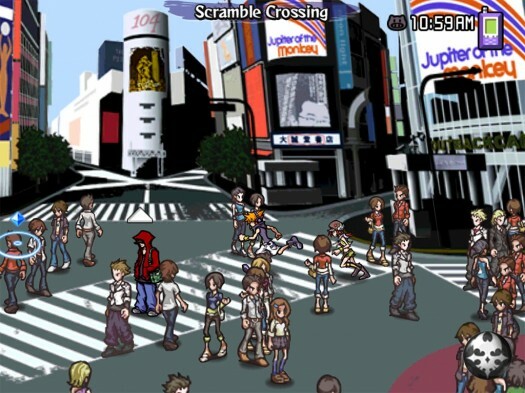 Nonetheless, it does make The World Ends With You: Solo Remix considerably more approachable, something that may well help it earn a new following among iOS users. By the way, your Pins can be leveled up. Depending on the Pin, they might even evolve into something else. There are two ways to make these things happen. The first method is to engage in gratuitous amounts of combat. The second is to simply keep the Pins you want to level up equipped when you exit the game. You’ll earn a certain amount of Pin Points during this down period. What else is there? There’s equipment you can purchase from the various stores in Shibuya, stickers you have to collect to upgrade your two-man party’s strength, food to eat and fashion trends to worry about. (Fashion trends are actually important here. If you’re dressed in the wrong threads in the wrong place, you might find yourself at disadvantage in your next fight. Eek.) Oh, and there’s a mini-game called Tin Pin Slammer that you can choose to lose yourself in. 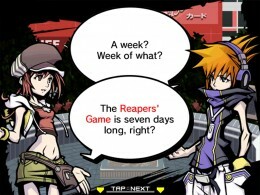 Long story short, you should probably buy The World Ends With You: Solo Remix. Yes, the price tag is rather astronomical when compared to bargain-bin, $0.99 titles but there’s a reason for that. The World Ends With You: Solo Remix is not a game built for five-minute diversions; it’s a solid game, one meant to leave a permanent impression. Square Enix probably could have done the port a little better (Universal build, anyone?) but all said and done, I couldn’t be happier.